Columbine flowers are recognizable by the long, trailing nectar spurs that extend from the bases of their petals, tempting the taste buds of their insect pollinators. New research at Harvard and the University of California, Santa Barbara (UCSB) helps to explain how columbines have achieved a rapid radiation of approximately 70 species, with flowers apparently tailored to the length of their pollinators’ tongues. Bees, for example, enjoy the short spurs of Aquilegia vulgaris, whereas hawkmoths favor A. longissima, whose spurs can grow to up to 16 centimeters. According to results published today in the Proceedings of the Royal Society B, the dramatic diversity in the length of the columbines’ spurs is the result of one simple change during development: the extent of cell elongation. "The evolutionary importance of interactions between flowers and pollinators has been recognized for centuries," says co-lead author Sharon Gerbode, a postdoctoral fellow at the Harvard School of Engineering and Applied Sciences (SEAS). "Charles Darwin, observing orchids, recognized that the extraordinarily long nectar spur on the Angraecum must have evolved in concert with the equally long tongue of the moth that pollinated it, but the exact mechanism for this kind of adaptation has been a matter of speculation." For more than 60 years, biologists have assumed that the length of columbine spurs was achieved primarily by cell proliferation. The new research reveals that proliferation plays almost no role at all in creating the vast diversity of Aquilegia species currently seen. In fact, 99 percent of the variation in spur length can be attributed to changes in cell shape–specifically, changing round cells into long ones. The researchers made more than 13,000 measurements to count the number of cells along the spur, as well as the area and degree of elongation of each cell. They found that cell division ceases early in the development of the spur–when it is about 5 millimeters long. At that point, the general pattern for the spur has been established, and all species of columbine petals look the same. From that point on, the cells elongate to varying extents, creating diverse spur lengths across species. 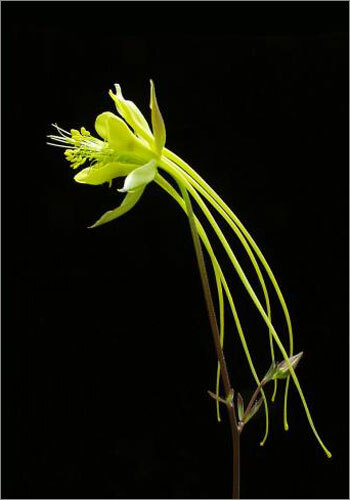 "The controlled elongation of cells within the petal spurs was a critical evolutionary innovation for Aquilegia, a genus that is considered to be a textbook example of adaptive radiation," says co-lead author Joshua Puzey, a graduate student in Harvard’s Department of Organismic and Evolutionary Biology (OEB). The researchers confirmed their results through mathematical analysis and modeling, and through in vivo experiments to disrupt cellular structure. The next step will be to examine several major hormone pathways and cytoskeletal elements that are known to influence cell elongation and developmental timing. "We want to understand the genes that are responsible for both the initial evolution of nectar spurs and their subsequent diversification," says co-principal investigator Elena Kramer, Professor of OEB at Harvard. It is clear, she says, that the starting point for the spur is likely to have already been present in the last common ancestor of all the columbine species. "Now that we understand the real developmental basis for the first appearance and diversification of spurs, we can make much more informed guesses about what genes contributed to the process," Kramer adds. "Fundamentally, these studies will help us answer questions about the genetic basis for speciation and how developmental processes evolve." Columbines show promise as a model organism for the study of evolution in plants because they have experienced such a rapid adaptive radiation within the past 3 million years. "The fact that this occurred quite recently is incredibly useful," says Kramer, "because it means that the species are still very similar to each other at the genetic level." Once researchers have identified the molecular signals that drive elongation in the spurs, the hope is that they will be able to recognize and understand speciation at all levels, from genes to populations. 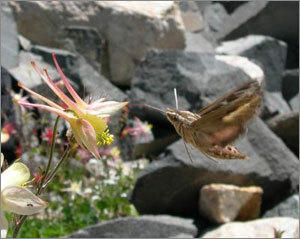 "Aquilegia serve as a nice example of how environmental selective pressures may drive extreme morphologies — as here the flower and pollinator strive for an exclusive relationship," adds co-principal investigator L. Mahadevan, the Lola England de Valpine Professor of Applied Mathematics at SEAS and Professor of OEB and Physics at Harvard. "Given that we can now manipulate spur length using externally applied drugs, our study even raises the possibility of artificially tuning that process and studying the results from an ecological perspective." This content was adapted from a press release issued by the Harvard School of Engineering and Applied Sciences. The research was supported by the MacArthur Foundation, the Wyss Institute for Biologically Inspired Engineering at Harvard, The Kavli Institute for Bionano Science and Technology at Harvard, the National Science Foundation (NSF), and the NSF-supported Materials Research Science and Engineering Center at Harvard. UCSB faculty member Scott A. Hodges served as co-author for the research.